Is it a pig? A rhino? A zebra? Heck if I know. But it's really freaking weird looking, that's for sure. A large browsing mammal, roughly pig-like in shape, with a short, prehensile snout. Tapirs inhabit jungle and forest regions of South America, Central America, and Southeast Asia. There are four species of Tapirs, being the Brazilian tapir, the Malayan tapir, Baird's tapir and the mountain tapir. All four species of tapir are classified as endangered or vulnerable. Their closest relatives are the other odd-toed ungulates, including horses and rhinoceroses. Ah, the odd-toed ungulates! Well, that explains everything. Undersides of the front (left) and back (right) hooves of a Malaysian tapir at rest, photo courtesy of Wiki. Those are pretty odd indeed. Where might you have seen tapirs before? (1) a zoo; (2) the opening scene of the 2006 film Apocalypto; (3) in the film, 2001: A Space Odyssey, during a prehistoric scene being killed by an ape. Also, according to Japanese folklore, tapirs can eat your dreams. The adults look kind of like a big wild boar; three of the species are mostly brown, whereas the Malay tapir has a white hind end, like someone spilled a bucket of paint back there. The babies, however, are uber-cute. 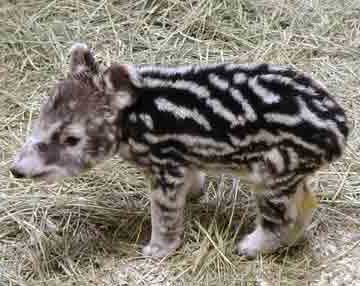 I unwittingly missed World Tapir Day (April 28), but I'm probably not the only one. 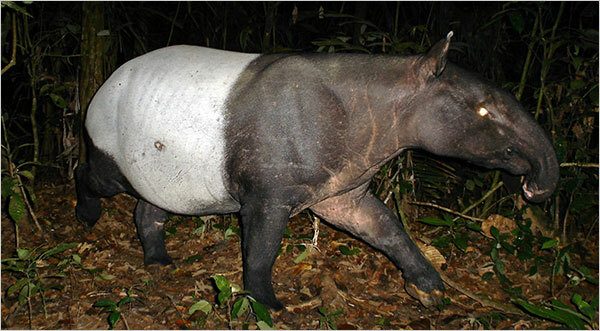 The NY Times article says the Malay tapir remained largely invisible to science until recently. Scientists set up cameras with motion sensors to capture photos and were able to (a) drastically reduce their estimate of the numbers in Malaysia, and (b) figure out that they really like salt. The photographs showed that tapirs normally have a small home range, but will travel up to three miles a night to reach salty mineral deposits, presumably to consume minerals like calcium or iron. One of the sites studied was the Krau Wildlife Reserve north of Kuala Lumpur. “At some of these salt licks in Krau, tapirs are the most common animal on cameras, but it’s all the same individuals coming back,” Dr. Traeholt said. The results showed that claims for a population of 800 to 1,000 individuals for an area the size of Krau, and 15,000 to 20,000 in Malaysia, were outlandishly optimistic. “This was way off reality. Otherwise we would have a traffic jam of tapirs in Krau,” Dr. Traeholt said. There were actually just 40 or so individuals in Krau, which would mean about 1,500 to 2,000 in Malaysia, he said. There are perhaps 300 in Thailand; an unknown, unstudied population in Myanmar; and an unknown but decreasing number on Sumatra. A best guess, he said, is 4,000 individuals in Southeast Asia, a figure similar to the number of wild tigers. Researchers want to know more about the tapir's habitat needs, social structures and behavior. For example, the article says, tapirs are patchily distributed in what seems like homogenous forest, but scientists aren't sure why.